Knitting is one of favorite types of needlework for many people. Almost each person in clothes will have several knitted things. This heat also is cozy and also it is fashionable and attractive. Interestingly, from where knitting when the first eyelet was born came? Different historians make different hypotheses of emergence of this fascinating occupation. The first knitted thing it is considered to be the children’s knitted sock found in one of tombs of the Egyptian Pharaohs which age is four thousand years. This sock reminds a modern mitten because the thumb on it was knitted separately to pass it throughout a thong of sandals which separated in ancient footwear a thumb from all others. Knitting came to the countries of Europe thanks to Christian missionaries. Their knitted things drew attention of people around and attracted great interest. Gradually local needlewomen seized this art, and by the 12th century many housewives knitted clothes for all family. In the 15th century knitting becomes already a business, and not just homework: knitting shops in which men work only are created. It is known that for protection of their interests even the law according to which women were not allowed to be hired was issued. However, in process of knitting distribution it became more and more women stuff. The first knitting machine appeared in the 16th century. It was invented by the English priest William Li in 1589. History of this invention and life of the inventor is very interesting. The theologian William Li, the graduate of Cambridge and Shakespeare’s contemporary, fell in love with the girl knitter. The girl was so engaged at work that she did not have time for appointments. The young scientist decided to facilitate a fate of the darling and to think up the car which would perform work for 10 knitters. And it managed it. However, the stockings made on this machine seemed to the English queen Elizabeth I too rough in comparison with knitted manually. She refused to the master the patent and advised to earn a living by “honest work”. William did not become puzzled and moved to France where he based in the capital of Normandy Rouen the first-ever knitting workshop. In the 18th century in France the first-ever circular knitted car was invented. From the knitted cloth connected by this car in the form of a pipe found the first knitted clothes. And the stockings knit by this car differed in quality and low cost that allowed them to press hand knitting considerably. However completely did not force out: handwork was always highly appreciated. Even less emergence of knitting cars influenced production of products, knitted a hook: cars did not learn to reproduce such knitting. In the 19th century knitting captured the whole world and, of course, Russia. In England ladies could connect everything that soul will wish: from the lacy air shawls and handbags embroidered by beads to mitts and pen-wipers. In Sweden short cardigans of manual knitting from an interlacing of two threads, in Austria – men’s jackets with difficult patterns enjoyed wide popularity. At Lithuanians it was accepted to exchange multi-color mittens of difficult knitting as a wedding gift. Indians of South America knitted caps and gaiters, Irish – sweaters with a large relief. A symbol of Scotland is the traditional knitted beret. 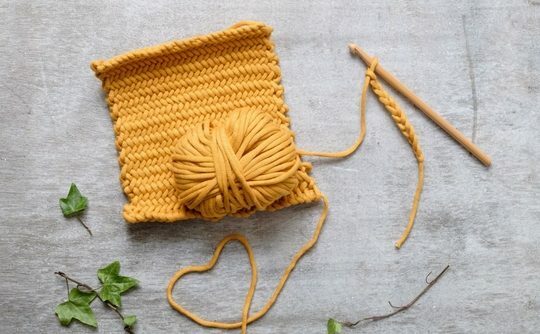 Since 2005 officially there was an unusual holiday which is celebrated on the second Saturday of June, – the World day of knitting on public. 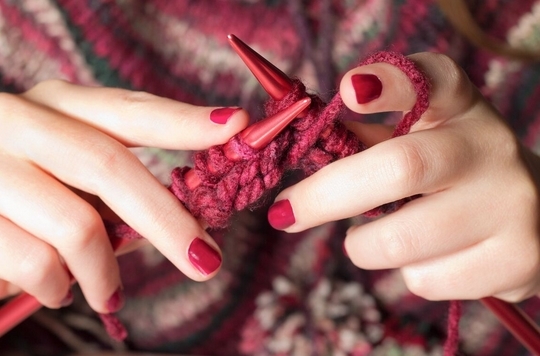 This day all fans of knitting gather in some public place ― cafe, the park or the square ― and do the favorite thing. This holiday in France thanks to Daniel Lendes arose, but over time it went out of the country and today is celebrated in the USA, England, Sweden, Finland, Norway and Estonia. By the way, in many places the action gained charitable character. Quite often needlewomen give all things connected this day to funds for needy citizens. Or expose them at fairs, and allocate all raised funds for the aid to persons in need. A huge number of people of different age and floor is fond of knitting. This ancient occupation continues to develop actively, turning into true art. The first schemes with designations of types of loops were invented in Holland in the 19th century; so far there are two unified systems ― British and American. In 1946 the national American competition in crochet was won by the man. In 2005 the new interesting direction ― knitted graffiti, or a yarnbombing appeared. It is a street art form where “bombers” yarn deck streets, recover and decorate the yards, parks, squares, using knitted cloths. Miriam Tegels (Netherlands) set a record on the fastest knitting and was included in the Guinness Book of Records. She knitted with an average speed of 118 loops a minute. Ukrainian Vitaly Vidal in 2006 knit by a hook a cap with a diameter of two meters and the having circle of six meters in size and also was included in the Guinness Book of Records. The biggest sock is knit by the female resident of Latvia Marina Voronovskaya. It is made of free rural wool, has length of 5 meters and weights about 15 kg. Marina took 2,5 months to knit the sock.